Admission: Free; donations accepted in receptacle near entrance. On my third day in the Fayetteville, N.C. area, I played golf and, then, played tourist. First thing in the morning, I made the 20-minute drive from my home base, the Sleep Inn in Spring Lake, to Bayonet at Puppy Creek in Raeford. 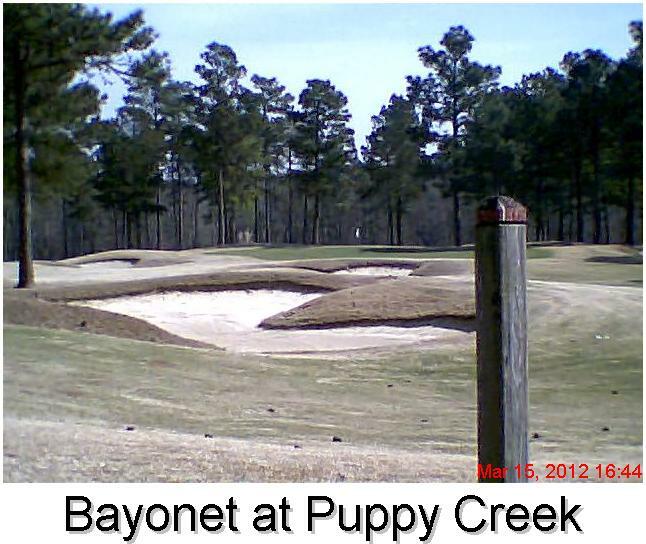 Bayonet opened in 1997 and was designed by noted North Carolina golf architect William C. Byrd. It is extremely playable and challenging in sensible ways. Between the creek that lends its name to the course as well as a number of man-made ponds, water is in play on 12 of the 18 holes. Byrd's design features three 90-degree doglegs (par-4 7th and 8th holes, par-5 18th) and four holes with lesser degrees of bend from tee to green. The four par-3 holes, and especially the 14th hole, playing 190 yards from the blue tee, are nifty. Bayonet is a good driving course, demanding accuracy but giving you some wiggle room in the landing areas. The greens had recently been aerated before I visited the course, but the putting surfaces have plenty of break and, I would imagine, carry a fair degree of speed through most of the season. For first-time visitors to Bayonet, I'd recommend a quick cart ride up the fairway on the par-4 7th hole if at all possible. The hole turns sharply to the right and requires some planning with the tee shot. From the white and blue tees, bigger hitters probably will want to go with something other than driver. The line of the tee ball also is important. The weekday green fee of $55 is just on the outside of the "Affordabili-TEES'' envelope. However, check out the stay-and-play packages available on www.golfontheready.com and I'm sure you’ll fashion a package that brings down Bayonet's greens fee. Having finished my round just after noon, I drove 15 miles to Fayetteville to tour the downtown area and visit the Airborne and Special Operations Museum. FYI, the U.S. military has a major presence in Fayetteville both geographically and economically. It's home to the U.S. Army's Fort Bragg Reservation and Pope Air Force Base. 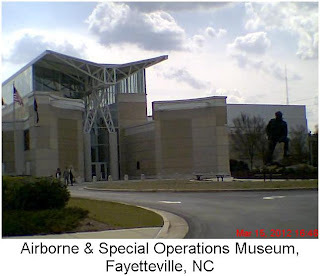 Fort Bragg is headquarters of numerous Airborne and Special Ops units, hence the impressive museum and its attention-grabbing exhibits that date from World War II to Vietnam and the ongoing engagements in Iraq and Afghanistan. Golfers and other tourists who are in the Fayetteville area should set aside a couple of hours to visit the museum. It's a cool place.